Whoopi Goldberg has stared in a lot of hit movies. She has everything that a star should possess, comical sense of humour, charisma and those infamous dreadlocks. You gotta love her she�s one of the best. Her role in Made in America as mother and bookshop lady is executed with flair and finesse. Zora Mathews (Whoopi�s characters daughter) finds out that the father she thought was her dad was not her dad after performing a blood test in a school experiment. She speeds to the local sperm bank with her friend Tea (Will Smith) to check the records and to find out who exactly is her father. After discovering this and being shocked at the outcome, she goes to confront her father who happens to be white and owns a car dealership. The car salesman is Hal Jackson (Ted Hanson) who after being shocked of this fact eventually meets mother Sarah (Whoopi Goldberg) and the web of human relations ensues. When doing reviewing a lot of movies you will probably find loopholes in every film you see. Films become more predictable and holes in the make-up of the film are seen. 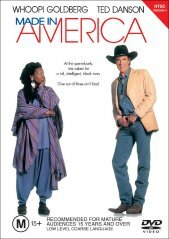 Made in America has a few of these loop-holes but not to the point where it will deflate the overall enjoyment of the film. Some parts of the film will have the viewer laughing heartily. Especially with the relationship between Hal and his rather odd girlfriend. Which can make any neurotic ex-wife seem like a romantic dream. Other parts of note are the commercials that are made by Hal, which are hilarious. Ted Hanson does a great job and makes some of the better advertisements we see on TV seem quite average. Typically American but fun nevertheless. After mentioning all these positives it would be a little unfair to rate it as an average film. Whilst it is fun and has an interesting storyline, it just seems a little samey or maybe it has something to do with seeing part of the film before. Whoopi is great and I�m sure if the viewer could relate to the storyline could get a lot out of this film. For all the Techies out there there is no low-level noise to speak of, or filters used in the production of the film. The whole screen is used throughout except for the great ending musical. This of course is one of the best parts of the film and definitely adds to the overall enjoyment of the film. Oh and Will Smith is funny too. With many good points, it must be said that they outweigh the bad. This is one of the better Hollywood films. There are no extras with this DVD.